ADRIAN Delap believes it’s a time for opportunity at Derry City Football Club this season with a new management team in place at Brandywell Stadium. Delap is one of four players who were under contract at the club when Declan Devine took charge last November, alongside Shane McNamee, Conor McDermott and Eoin Toal. He signed a three-year deal last September after impressing in his breakthrough season in 2018 and the Co. Donegal lad is hoping to kick on this season under Devine. Delap believes it’s a clean slate for everyone and after a promising pre-season which included goals in wins against Finn Harps and Isle of Man FA, he’s hoping he can establish himself in the team. “It’s a completely clean slate and you just want to get into the starting team for the season now,” he said. “There are that many new players so there’s good rivalry between players in different positions. “As long as you put in the hard work in training the manager won’t hesitate to throw you in. 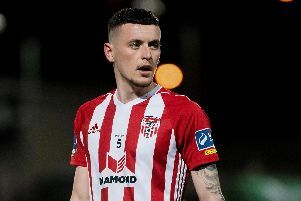 The 20 year-old has made 14 senior appearances for the Candy Stripes and announced himself to the City Faithful last August when he scored the winning goal in the FAI Cup against St Pat’s to send them into the quarter-finals. He’s hoping for more of those memorable nights and to add a few more senior goals to his name. “Everything has intensified over the last few weeks. We’ve got a few good games under our belts in pre-season so it’s looking good so far. So what’s been the most notable change since Devine has taken over? “The intensity and the fact the boys are wanting to work hard,” he explained. “It’s a completely new group and we’re trying to figure out about each other. “There are a few good characters in there as well who are bringing the group closer together so it’s a tight knit group at the minute which is good.